"It is with great sadness that we bid a fond aloha pumehana to Professor Klaus Wyrtki, a great scientist, and a true friend and mentor to his many students and colleagues throughout the world. He passed away peacefully on February 5, 2012, two days before his 88th birthday. Klaus made numerous fundamental contributions to observing and understanding important ocean and climate processes during his distinguished career. These ranged from abyssal circulations to the intermediate oxygen minimum, from his pioneering work on the Indonesian Throughflow, the Peru‐Chile current system, to his work on the equatorial currents in the Pacific, and his discovery of strong semiannual Indian Ocean equatorial zonal flows ‐‐ the Wyrtki Jets. Klaus is most famous for his work on the El Niño/Southern Oscillation phenomenon, piecing together ship winds and island tide gauge records to discover the ocean physics that are essential in the development of these extreme climate events. He hypothesized that El Nino was a predictable phenomenon at lead times of a few months, and inspired and conducted research programs that ultimately were able to demonstrate and exploit this predictability. Klaus published more than 100 papers, a monograph on The Southeast Asian Waters, and the Atlas of the Indian Ocean Expedition. He chaired the North Pacific Experiment (NORPAX), and led the Hawaii‐to‐Tahiti Shuttle Experiment. He served on national and international committees that shaped oceanography and climate research as we know it. He received wide recognition for his contributions, including the Rosenstiel Medal, the Albert Defant Medal from the German Meteorological Society, Maurice Ewing medal from the AGU, the Sverdrup Gold Medal from the AMS, the Prince Albert I medal, and the Alexander Agassiz Award from the U.S. National Academy of Sciences. Klaus was one of the founders of the Department of Oceanography at the University of Hawaii at Manoa in 1964. He worked with students and staff to build the Pacific Sea Level Network to monitor geostrophic flows in near‐real time. 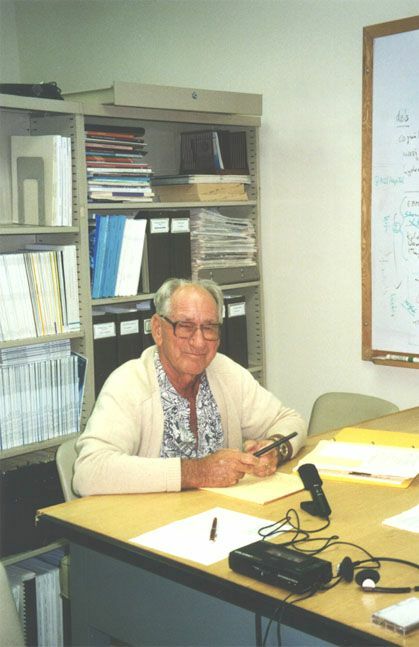 He established the Sea Level Center in the Joint Institute for Marine and Atmospheric Research, which has played a major role in subsequent climate research and in providing operational observations for ocean initialization and tsunami warnings. Klaus effectively communicated his confidence in the value of careful observations. He was thrilled by the developing technologies that enabled new views of the ocean. While he taught the value of consistent time‐series and attention to detail, he urged us to step back to get the big picture without getting lost in the noise. The oceanography and climate communities broadly benefited from his knowledge, experience, and his humanity. Klaus' students, research staff and close colleagues benefited tremendously from the great latitude and support that he gave them, his clear advice, and his kindness." which was reprinted in Historisch-Meereskundliches Jahrbuch 2000, Vol. 7, 49-94; and in the collection by M. Jochum and T. Murtugudde (eds. ), 2006: Physical Oceanography. Developments since 1950, Springer Verlag, ISB 0-387-30261-1, 203-238; Later it was put online by the Niels-Bohr Library and Archives of the Center for History of Physics. For the Germans among the readers it may be interesting to learn that Klaus was born German, and that he started his scientific career with employments in Kiel and and the DHI - among others with work on the Baltic Sea. More on this aspect in the interview. Brauchen wir eine Kritik der Ökodiktatur?